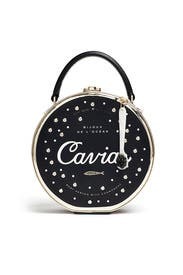 Polished yet playful, this caviar coin purse by kate spade new york is pretty much a piece de resistance. Black leather circular handbag with front caviar can detailing and caviar spoon zipper pull. Glitter detailed sides and top zipper closure. Top handle and adjustable shoulder strap. 9.5" in diameter and 3" deep. Fun bag for New Year's Eve! 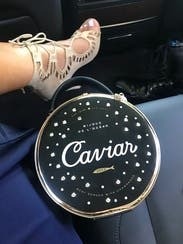 Loved the whimsical bag for a night out. My one concern is that the latch isn't super secure, so be careful! Favorite part of outfit!!!! So glad I got this for NYE! Perfect with Kate Spade Black Bow dress. Simply gorgeous little bag! Comes with long removeable strap too. I prefered wrist handles alone Large enough to hold necessary cosmetics and keys and stuff. Roomier than expected. Inside pocket for card. I loved this!!! Get it! Paired with Kate Spade black bow dress. My husband actually picked this out at the RTR store in Chicago. Not something I'd normally get but I'm glad I did. Tons of compliments! Used it for a party and even just for a trip to the grocery store because, why not? Beautifully detailed bag looks amazing under candlelight or "disco lights." Wore it to my niece's party. Everyone loved it! Wore it for Valentines Day and a Mardi Gras party! This bag was the perfect compliment for several outfits over my birthday weekend. It matched well with my Nicole Miller party dress and acted as a pop of fun for my jeans the next day for brunch. 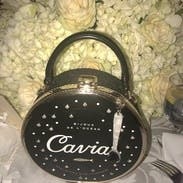 I took this to nyc as an evening bag and we had so much fun showing it off everywhere we went. The tiny caviar spoon is hilariously awesome. It's perfect size for a smartphone, some makeup, gum or mints, and I even squeezed my glasses in there. The removable shoulder strap is nice for if you go dancing and don't want to juggle your cocktail with your handbag. I love this purse! It was perfect for our 1940's themed ARTini Gala. 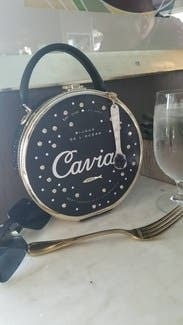 I even met friends for coffee and even the men loved this purse! I can't wait to rent this again! Kate Spade never disappoints!! A perfect size for going out: it's deep enough to fit your phone, wallet, lipstick, fashion tape...all the essentials! The rhinestones on the front add to the sparkly, special-occasion look. I rented this bag to lighten up a more formal outfit, and it worked really well. Recommended! The cutest bag on the planet! I am obsessed with this bag. I had been wanting it for months, but when I saw it was available for rent instead of me dropping $300+ I was so happy! Although I think most people may want to use this for a formal affair, I think it works for everyday. It's very well made and sturdy. I love love love it. Super cute bag. I ended up buying it. It holds a lot for a small bag including my large iPhone 8 Plus which often doesn't work with evening bags. Worked well for a dressy night out but can also be worn with jeans as a bar bag or for a more casual event. So extremely versatile. Comes with a cross body strap so can be worn either way. Received tons of compliments. 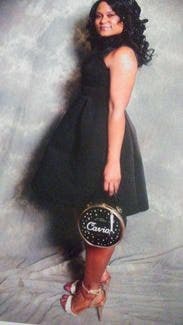 I loved this ridiculous purse, I got so many compliments and had a lot of fun showing this side of my style . I absolutely loved this bag! It was so adorable and received so many compliments on it... wish I owned! So adorable. Big enough to fit everything you need and more. Rented through unlimited so ended up buying it. Perfect size, fit reading glasses, sunglasses, iPhone, keys and more! 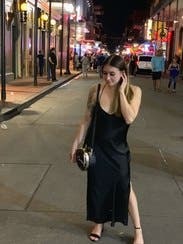 Wore out to a jazz club with a LBD. Totally cute!! Absolutely the epitome of a Kate Spade bag #angel. I seriously planned my outfit around the bag. 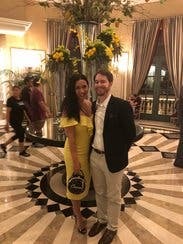 I wore it for a polo match sponsored by a biiiig champagne company. It was only fitting to have "caviar". The bag is very spacious and comes with a shoulder strap. You'll b surprise at how versatile it can be. Dress it up or down, it's just a lot of fun and compliments! This is a cute bag but it was huge, larger than what I prefer for an evening special occasion bag. I didn't end up wearing but I do like the style. 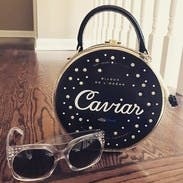 I've been eyeing this bag and rented it for a 1920s themed party. The detail is adorable and I received many compliments. I needed up wearing it again with just jeans and a tee-shirt. It's a showstopper for sure. Perfect going out bag, would buy it if I could!!! This bag is precious and there is a ton of room inside (I packed away two iPhones, lipstick, fashion tape and m&ms and there was still room to spare!). Purse is an eye catcher, but very small. It did fit my iphone 7s plus in, but your limited on space. It was hard to keep the clasp closed, and a rhinestone was missing when arrived. Received alot of complements. I loved this purse! I got compliments everywhere I went! You can dress it up or wear it with jeans, absolutely loved it! Loved this cute bag! You can use it as a clutch style or crossbody and it fits a pretty good amount of stuff in it. Would rent again! It was so cute and fun,I did not want to return it!! I love all the little Details and fun charm. I got a lot of compliments on it. So cute! And fits more than a matchbook! Great bag to wear to medical society holiday party. 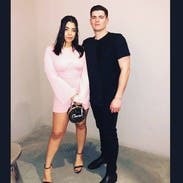 Lots of comments. 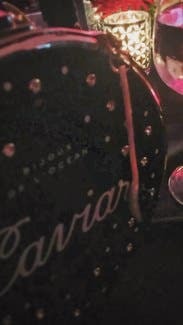 Loved the little caviar spoon. And it actually held all my belongings for the night -phone, speech, compact, lip gloss, keys, etc!